Welcome to Sutter’s Marina on Irondequoit Bay! We provide full service and affordable docking to make your boating season headache free. We are committed to giving every customer a truly enjoyable experience and all the help they need. Sutter’s Marina on Irondequoit Bay was established in 1972 by Al Sutter. He and his staff have been providing Rochester’s residents with a close, enjoyable, and affordable solution for your boating needs for over 40 years. Continuing this dedication is Ryan Sutter, who took over the helm in 2011. Al and Ryan have been committed to offering the best service to make your boating season the best it can be. 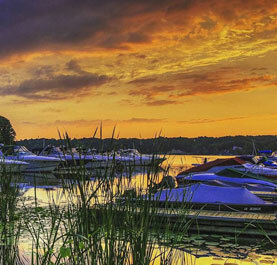 At Sutter’s Marina on Irondequoit Bay we are proud to say that we are a full service marina. If you are pulling into our gas dock, you can expect one of our friendly staff members to be there to give you a hand docking your boat and then we will gas your boat up or pump out your boat for you. There is no need for you to step out of your boat. We also offer winter storage, cleaning services, shrink wrapping, bottom washes, spring services, fall services, ice, snacks, drinks, vending machine, remodeled bathrooms, and have a full service gas and pump out station. Summer is always fun at Sutter’s!